The City of Ventura is grateful for the generous donation of $139,604 from Pier into the Future into the Ventura County Community Foundation Ventura Pier endowment. This is an amazing accomplishment and we appreciate all the volunteer hours and dedication over the past 25 years by Pier Into the Future. This City’s partnership with Pier into the Future provides a funding source for routine pier maintenance projects. The City may use the annual interest earnings from the Pier Fund for maintenance projects to protect the pier. The City has contracted with Meek Construction to perform needed maintenance this fall. The work includes driving five new wooden timber piles, replacing the protective wrap on two existing piles, as well as repairing or replacing 20 of the pipe braces. Visitors to the pier may have noticed rust and corrosion appearing on the steel support sections at the Mill’s End of the Pier. Steel corrosion in a marine ocean environment is not uncommon. The amount of corrosion and rust currently present is becoming a concern. If left unchecked, the corrosion will affect the structural integrity of the steel section of the pier. In the 2016 budget, the City Council has allocated $29,000 to hire Noble Consultants to evaluate the extent of the corrosion. After analyzing the existing conditions the engineer will recommend treatment methods as well as protective coatings to be used and will prepare bidding documents for the project. The first phase of the project is estimated at $250,000, which is not budgeted for. The City and Pier Into the Future are discussing this critical project and options to raise the funds. We hope you will continue to support the Pier. We have now contributed $1,000,000 into the endowment managed by the VCCF. Interest accumulated in the fund has been used by the City to maintain the pier. It was not that long ago, before the Pier was rebuilt, that the Pier was closed for a significant period of time. In the 22 years after it was rebuilt, we all may have been guilty of taking the Pier, as we know it for granted. The time has come that it needs our support and attention in order for it to continue to be an icon in our community and the region. The City has taken an important first step by seeking a study of critical work that has been identified to preserve the pier. We encourage you to continue to keep the pier in the forefront of your thoughts and urge the City Council to make a priority of considering it’s ongoing needs in order that it remains safe, accessible and a most visible treasure. The board is currently engaged in efforts to broaden our reach and seek new opportunities to collaborate with other organizations, and leverage opportunities to raise awareness and seek donations. We encourage you to contact us to get involved! Thank you for your continued support of the Pier. We look forward to continuing to work on your behalf to ensure that the Pier is part of our future and hope to see you October 3rd at Pier Under the Stars. While many area fundraisers are being canceled or scaled back because of the uncertain economy, the 18th Pier under the Stars food and wine tasting event Saturday evening in Ventura was the most successful ever, with about 60 restaurants and wineries offering food and drinks to the about 1,000 people gathered. According to Jenise Wagar, executive director of the Pier into the Future board of directors, which puts on the event, the VIP section sold out early. 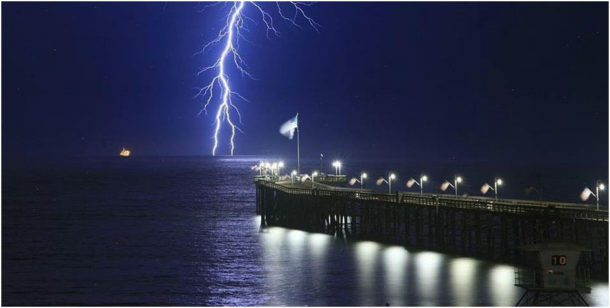 Wagar thinks the event continues to be popular because of the venue on the promenade in the shadow of the Ventura Pier. She said the pier is an integral part of Ventura, up there with two trees and the cross at Grant Park.